CSA Sign Up! Buy a share of truly amazing vegetables. These are the love notes that have been arriving in our mailbox from our dear CSA members. We are so grateful for this feedback, and sometimes we blush. Now it is time to share this information so that more people know how wonderful our vegetables are! 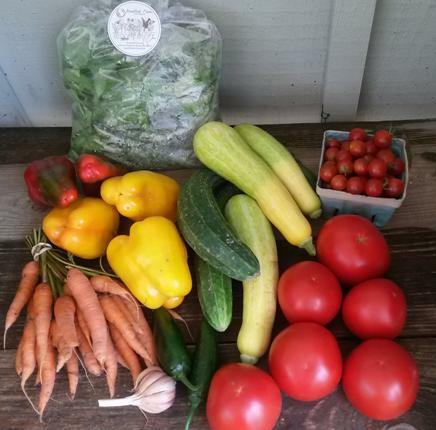 Pictured here are various Farm Share CSA shares from 2014. 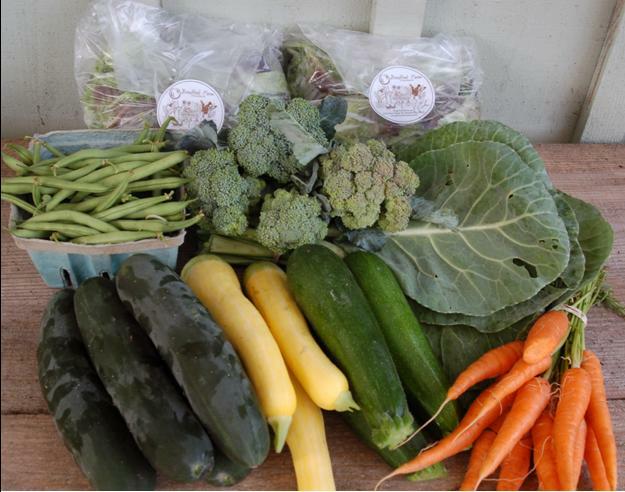 We are enthusiastically inviting more people to join the Farm Share portion of our CSA. This is where community members invest in our farm ($525 for the 2015 summer season, May – September) and in exchange, we work our hardest to provide members with a diverse, bountiful, weekly share for 21 weeks, with an average anticipated value of $26 of produce per week, picked up on Wednesdays at our farm or in Church Hill. :: Our vegetables are completely different than vegetables available from grocery stores. Taste them, and you will realize the difference. Children respond especially well to our produce – eating it because it tastes great! Taste correlates with nutrition…by choosing the tastiest vegetables, you are choosing the most nutritious. :: Everything we sell is grown by us, on our farm in Chesterfield county. You are invited to public tours in the spring and fall so that you can learn how we grow food for maximum nutrition, taste, sustainability, and the health of all beings. :: We are Certified Naturally Grown, ensuring you that we use only plant, animal, and mineral based inputs for the soil and plants. No synthetic/chemical fertilizer, pesticide, fungicide, or herbicide, nor any GMO products, are ever used on our farm. :: Sourcing your vegetables from a local, Certified Naturally Grown farm like us is the best way to work toward community food security for future years. 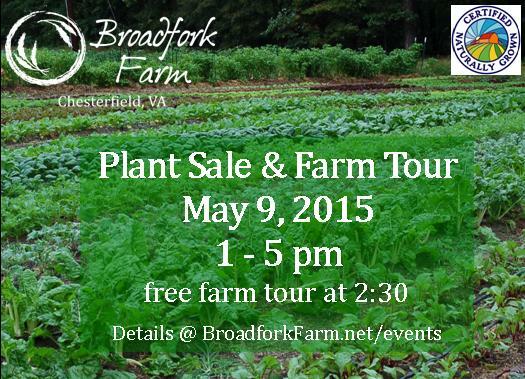 Most produce eaten in Virginia today is trucked here from California – not the securest, freshest, or tastiest option! :: The majority of the food on our plates should be vegetables. We all know this! Make it a reality this season by committing to a share of weekly vegetables (or two shares, if your household is large enough). We help with recipe ideas. 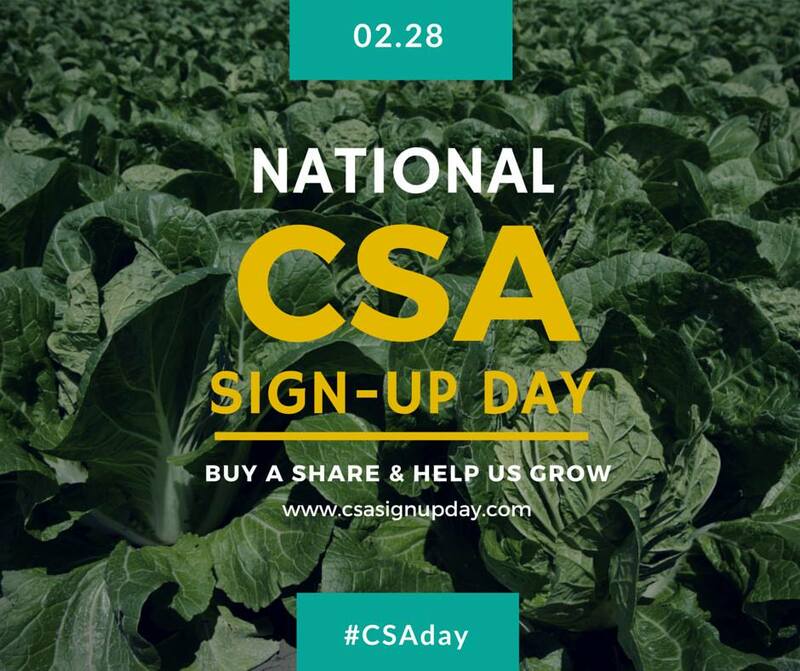 February 28 is National CSA Sign-up Day. The majority of our expenses take place January through March. Buy a share and help us grow. Learn more and sign up on our CSA page. We love being vegetable farmers in this community. Thank you for trusting us with this responsibility and privilege. Please forward this email to anyone you think may benefit.